"Great talent, great imagination, and real been-there done-that authenticity make this one of the year's best thriller debuts." "Not since Fleming charged Bond with the safety of the world has the international secret agent mystique been so anchored with an insider's reality." "A real spy proves he is a real writer--and a truly deft and inventive one. Spycatcher is a stunning debut." 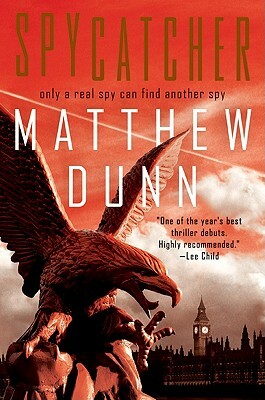 A real life former field officer, Matthew Dunn makes an extraordinary debut with Spycatcher, a masterwork of international espionage fiction that crackles with electrifying authenticity. Fans of Daniel Silva, Robert Ludlum, Brad Thor, and Vince Flynn will be on the edge of their seats as intelligence agent Will Cochrane--working on a joint covert mission for the CIA and MI6--sets out to capture a brilliant and ruthless Iranian spy. Timely and gripping, Spycatcher rockets the reader into a shadowy world of terrorism and counter-terrorism, and holds them in an iron grip until the last pulse-pounding page is turned.